We're in Germany around easter, and last week allowed a trip into Hamburg for two beery events. First was the weekly Open Bottle at the Craft Beer Store in Sternschanze – this is a weekly free tasting of a new beer, sometimes from the adjacent Ratsherrn Brauerei and sometimes from elsewhere. 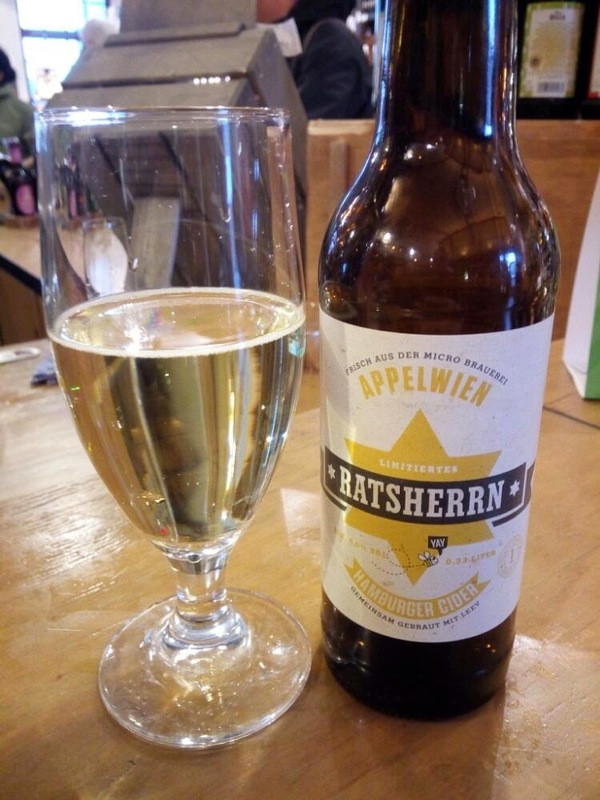 This one turned out to be a chance to catch up with Ian Pyle, the Bavarian/American/British-trained brewmaster who runs Ratsherrn's pilot brewery, and to sample something unexpected: a cider that he calls Appelwien – that's Apfelwein in the local Plattdeutsch (Low German) dialect. He was also pouring Steuerbord, his new dry-hopped Pils. Ian noted that Appelwien was fermented from Holsteiner Cox and Boskoop apple juice, which was supplied unpasteurised by a local producer Leev, and used wine yeast – he doesn't want wild yeast around his brewery! He said he wanted it to be more along the lines of Normandy cider than British scrumpy, although there was no French-style maceration, which sweetens the brew a bit more. And although the apple varieties used are better known as eating apples, he said the juice is actually slightly more acidic than that from bittersweet British cider apples. The result is very drinkable, with a fruity nose that has almost a white wine character, and a dry-sweet tangy body. I found it a little sweet in the finish, but Ian said the residual sugar level was actually pretty low, so maybe it's just my preference for bone-dry perries! So what's it like switching from beer to cider-making? “It's easy for a brewer, although there's a lot of best practice to learn and you need to select your ingredients and your yeast carefully,” Ian said. He did small trial batches using three different apple juices and three different yeasts before settling on the Cox/Boskoop pairing with Muller-Thurgau yeast. Steuerbord was quite a different proposition. Dry-hopped or late-hopped – Hopfenstopfen in German – with Opal, Saphir and Smaragd, it was aromatic, dryish and crisp, but with surprisingly little bitterness. 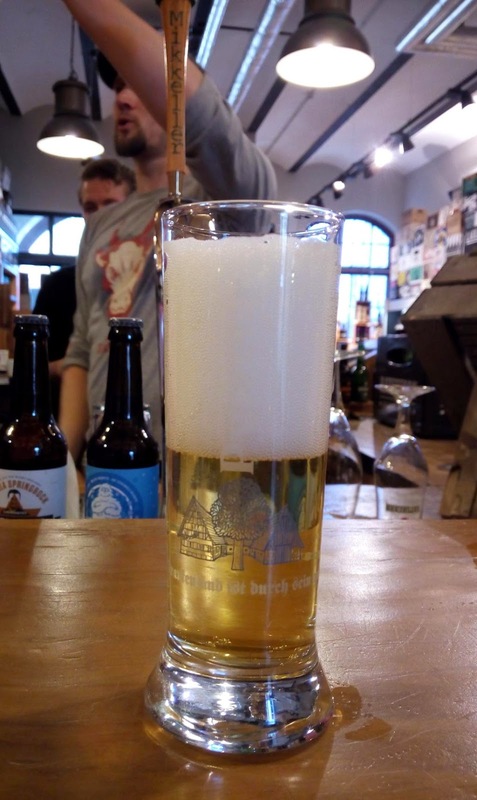 Ian said that the hops were almost all whirlpool additions, as he wanted to emphasise aroma over bitterness. The crisp dryness comes more from it having a very low residual extract (ie. most of the sugars are fermented out). Overall it had a slightly biscuity character, and I picked up hints of peach and lemon, plus a faint salty and flinty mineral edge. It's an intriguing beer that shows just how varied Pilsners can be, at least when a brewer bothers to try something different from the generic Bitburger/Krombacher/etc style. The evening's second event was Reinheitsverbot (which approximately translates to "beer purity banned"), a beer launch at a bar not far from the Reeperbahn that's trying to build itself as a craft beer venue. It's a regular introductory evening for their beers of the month, albeit without the free tastings. I was looking forward to it as they were easter beers I'd not tried before – or I was until I walked in there, and discovered it was one of the few all-smoking venues left in Germany (pubs often have a smoking room, but the main bar will be smoke-free). Worse, there wasn't any ventilation and although the place had just opened for the evening and I was the only non-staffer in there, the ashtrays were still full. It stank as if they wanted it to stink (which of course they didn't – see below). I felt physically sick and did something I've not done in a while – turn on my heel and leave. Quite apart from not wanting to end up smelling like an ashtray myself, trying to taste decent beer in such an environment would have been a waste. On the plus side, heading back earlier than planned meant I was in time for dinner and some extremely nice red wine, so the evening was still a win. Update... I've had an email from Erin, one of the Reinheitsverbot organisers, who tried to comment here but couldn't for some reason. I misunderstood the nature of the place: they run it as a bar only from Thursday to Saturday, she says the rest of the time it's used by the restaurant upstairs as a smoking lounge (! ), so it was the upstairs staff who'd not cleared up. The evening crew had only just come in they'd not done it yet – I arrived a few minutes before 8pm, thinking that was simply when the introductory event started, and only realising once I got downstairs that 8pm was actually the bar's opening time for the evening. She adds, "Neither of us are smokers; we would also prefer better ventilation and fewer cigarettes in our work space. But this is a neighborhood bar in St. Pauli, the red-light district, and every bar we've been to in our neighborhood allows its guests to smoke. I would like to see our bar be non-smoking until 10:00 p.m., but again, the restaurant opens before the bar does, so that's not a possibility." I guess that shows how long it is since I (once) went drinking around the Reeperbahn! It's a shame, because I still very much like the idea behind the bar/event. Maybe it'll be better during the summer – Erin says when the weather's nicer, people go outside to smoke instead of downstairs. Interesting. Unsure of the Hamburg smoking laws but I'd have done the same. Shame really, but they'll hardly succeed as a craft beer venue on that basis. I think German law was based on the size of the room and whether you have staff. If it was below a certain size and operated only by the owners, you could allow smoking. But I'm told the law was changed last year, and you can now buy a licence to allow smoking in your venue.